Help. Wedding Dress Practice A Complete Failure. See. Failure. I was so effing pleased with myself last night putting in that invisible zipper. Looked so pretty on the right side, basted it on the left. And was greeted with this horrid mess. The waist band seams are like a whole inch off. The skirt is also about an inch off (which means the skirt and waistband themselves are okay). Really, the left back bodice is somehow an inch longer than the right. BUT. I am now very intimidated about starting the wedding dress from this pattern that I made in my head and on graph paper with no previous pattern making experience (idiot). What should I do about the wedding dress project? Scrap the whole thing and go visit David? Or J? What about using one of the below two patterns? On the left is Vogue 8814. The waist is not exactly what I had in mind, but is not a straight cut across the middle, which is what looks very bad on me. 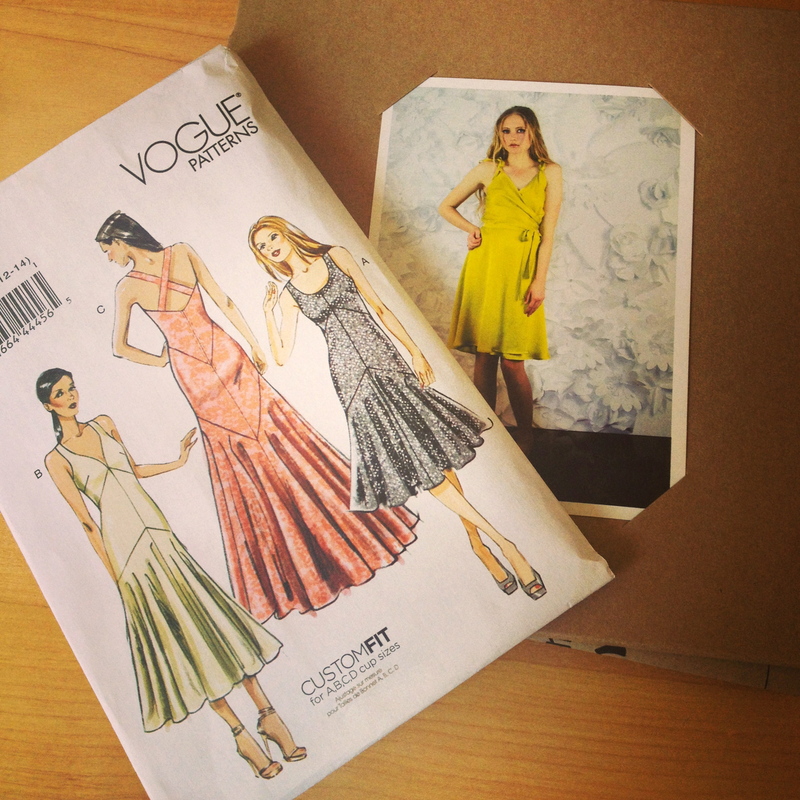 It’s a custom fit, so maybe less muslin-ing required than typical with Vogue? I’m worried what all that piecing would look like on the silk charmeuse? I would probably slim the flare on the skirt, do a sway back adjustment, and hack off 2 inches from that middle paneling, because short person. On the right is Papercut Patterns’ wrap dress named after a play. I’ve really wanted to make it, but I don’t know if it would look bad in the long length. I could extend the length, but the only flattering photos the internet could give me of a woman in a full length wrap dress were of Miranda Kerr, and let’s be serious about our respective bodies. If I pursued option B, I would lengthen the dress, but bring the flare in a little bit when doing so. I’d also self line that fabric. I travel for two weeks for work starting tomorrow. After that, I’ve got six weeks before this ish needs to be done. Pros? Cons? Thoughts? Cautionary tales? Give me what you’ve got. Oh my! situation looks familiar 🙂 When I started making dresses three years ago I did the same mistakes with zippers. How about if you do your dress yourself but let professional seamstress do the zipper? My other advice is: don´t try to save money on wrong place 🙂 Perfect wedding dress is worth of every penny. Two good pieces of advice! I think the problem is with the left back — I’m going to try to make it still, but am in search of a good backup. 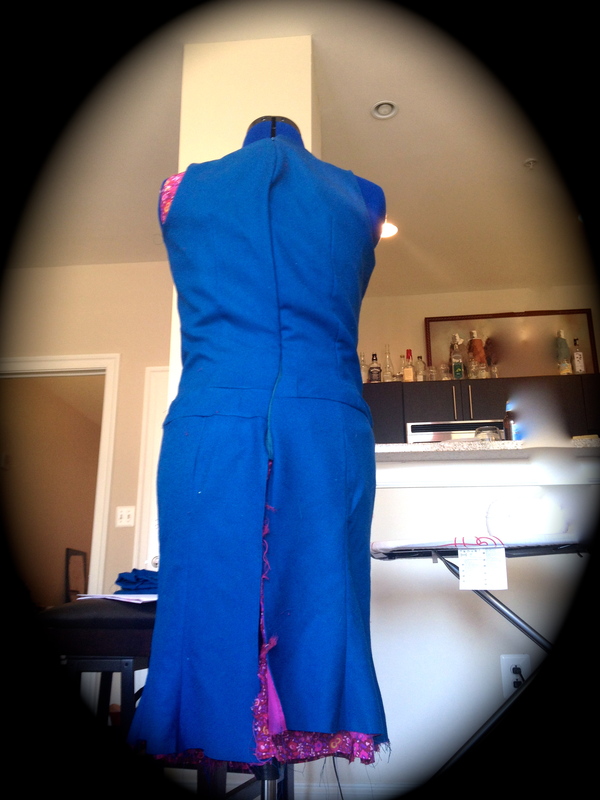 Have you considered re-cutting the back left bodice and trying it again? Perhaps when you cut the 2 back pieces together, the bottom fabric (where the left back bodice would be) was a little stretched. If your right/left back patterns are the same, the length from neck to waist, waist to hem should be the same. Also be sure to interface along the zipper to stabilize it, there might’ve been stretching caused by setting that in. Hmm…the underlining should’ve worked to keep the shape, so odd. Yes, you can use fusible interfacing on top of the interlining, you just need to test it on scraps first to see how it changes the hand/feel of the fabric. A soft tricot might be a good one, as it’s less likely to leave visible lines on the face of the fabric. Another option would be to sew a staystitch down the CB pieces within the seam allowance before you put in the zipper, similar to what you would do along a neckline, that would also stabilize the fabric along the seam. Oh yes, I would definitely go back to having your waistband grainline on the straight grain. That way the crossgrain will provide some give when sitting/moving, but also has elasticity and bounces back. The bias just gives, and gives, and doesn’t necessarily bounce back.